While companies have not been hesitant to incorporate new systems like SAP ERP software into their warehouse, not all organizations use these tools to their full potential. According to ZD Net, the future of defining ERP success will no longer be based on just internal effectiveness. Future goals will directly correlate with a company's ability to connect all of its people, systems and constituents, according to the website. This type of connectivity will require new technology, such as mobile data collection, hand-held devices and barcode scanning software. A key to incorporating these solutions is customization, such as that offered by RFgen Software. The company provides mobile enterprise applications that allow these new technologies to integrate with existing ERP solutions seamlessly. Enterprise mobile solutions are available for companies harnessing a wide range of ERP providers, such as SAP, Deltek Costpoint, Oracle, JD Edwards or Microsoft Dynamics. The ease of customization offered from RFgen allows these solutions to be incorporated quickly, accurately and affordably. Mobile devices will be used on manufacturing shop floors and in clean rooms, creating the need for customizable displays allowing workers to use software while wearing gloves and other safety attire. Not all shop floor employees speak English as a first language, but they still need to be able to use mobile data collection devices. Customized applications should include the ability to quickly switch the display to an alternative language. The applications offer many other customization options, and organizations can develop solutions that are just right for their operations. The key to keeping these solutions affordable and effective is the ability to pull data and interface with existing legacy or external systems. 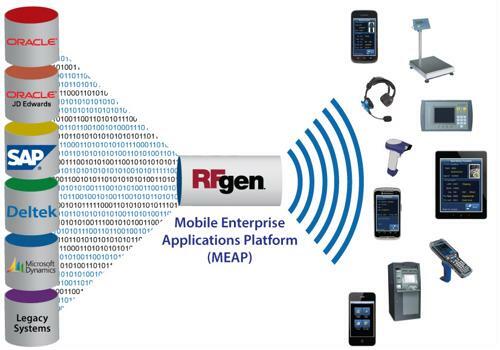 With the mobile enterprise application platform from RFgen, companies get their smarter warehouse up and running with technology that will keep them competitive in an increasingly complex supply chain.